Magnetism is a fundamental force of nature manifested by the attraction of certain materials for iron. Materials so attracted are said to be magnetic materials. Humans have known about magnetism since at least 600 B.C. The force was almost certainly first observed in the attraction between the mineral known as lodestone, a form of magnetite, and pieces of iron. Englishman William Gilbert (1540–1603) was the first person to investigate the phenomenon of magnetism systematically using scientific methods. He also discovered that Earth is itself a weak magnet. Early theoretical investigations into the nature of Earth's magnetism were carried out by German physicist Carl Friedrich Gauss (1777–1855). Some of the earliest quantitative studies of magnetic phenomena were initiated in the eighteenth century by French physicist Charles Coulomb (1736–1806). Coulomb found that the force between two magnetized objects is an inverse square law. That is, the force increases according to the magnetic strength of the two objects and decreases according to the square of the distance between them. Danish physicist Hans Christian Oersted (1777–1851) first suggested a link between electricity and magnetism. Oersted found that an electric current always produces a magnetic field around itself. (A magnetic field is an area where a magnetic force is present.) Shortly thereafter, French physicist André-Marie Ampère (1775–1836) and English chemist and physicist Michael Faraday (1791–1869) demonstrated the opposite effect, namely that moving a wire through a magnetic field could produce an electric current in the wire. The experimental work of Oersted, Ampère, Faraday, and others was brought together in a brilliant theoretical work by Scottish physicist James Clerk Maxwell (1831–1879). Maxwell demonstrated that electricity and magnetism represent different aspects of the same fundamental force field. The magnetic force present in an object seems to be located in two distinct regions of the objects known as poles. One pole is known as the north magnetic pole, while the other is known as the south magnetic pole. The magnetic force appears to flow out of one pole and into the other pole. The region of space through which the magnetic force flows is called the magnetic field. Earth itself acts like a giant magnet. One pole of Earth's magnet is close to the north geographic pole, and the other pole is close to the south geographic pole. The magnetic properties of Earth are thought to be due to the presence of a very large mass of iron located at the center of the planet. As that core rotates, it may generate the magnetic field that we can detect with a compass. The magnetic field is invisible. It can be detected, however, by spreading finely divided pieces of iron in the region around a magnet. In that case, the iron pieces arrange themselves in a pattern similar to that shown in the accompanying photograph. The white streaks in the photograph are known as magnetic lines of force, or flux lines. They indicate the regions in which the magnetic force appears to be strongest. The laws describing magnetic poles are similar to those describing electrical forces. That is, like poles repel each other, and unlike poles attract each other. If two magnets are lined up with their south poles adjacent to (next to) each other, they will tend to push apart. If they are lined up with a north pole next to a south pole, they tend to draw close to each other. If an unmagnetized piece of iron is placed near either a north or a south pole, it is attracted to that pole. Two kinds of magnets exist: natural magnets and electromagnets. Magnetite and lodestone are two examples of natural magnets that occur in Earth. Any iron bar can also be made magnetic simply by rubbing it with magnetite, lodestone, or any other magnetic material. Bar magnets and horseshoe magnets are made in this way. A second kind of magnet is an electromagnet. The magnetic field of an electromagnet is produced by wrapping an electric wire around a piece of iron. When an electric current flows through the wire, it creates a magnetic field in the iron. The strength of the magnetic field depends primarily on two factors: the number of turns of wire on the iron and the strength of the electric current. The most powerful electromagnets known are made of superconducting materials. A superconducting material is one that carries an electric current without any resistance. Once an electric current is started in a superconducting material, it continues to travel through the material—essentially forever. The magnetic field surrounding a natural magnet, such as a bar or horseshoe magnet, measures a few hundred gauss. The gauss is one of the units used to measure the strength of a magnetic field. The magnetic field produced by an electromagnet, by contrast, is in the range of a few tens of thousands of gauss. The highest magnetic field achieved by a superconducting electromagnetic approaches 100,000 gauss in strength. Magnetism is caused by the motion of electrons in an atom. Picture an atom, consisting of a central core, the nucleus, and one or more electrons traveling around that core. Those electrons exhibit two kinds of motion. First, they travel around the nucleus of the atom in a manner somewhat similar to the motion of planets around the Sun. Second, they spin on their own axes, much as planets spin on their own axes. Now recall how an electric current flowing through a wire sets up a magnetic field around that wire. In much the same way, a moving electron sets up a magnetic field around itself. Both the orbiting motion of the electron around the nucleus and the electron spin create magnetic fields. In a magnetic material, atoms group themselves into microscopic regions called domains. All of the atoms within any given domain are aligned in the same direction. The domain itself, therefore, acts like a very tiny magnet with a south pole and a north pole. Under most circumstances, however, the domains in a magnetic material are arranged in random order. They point in every which direction and, overall, cancel each other out. The material itself is not magnetic. 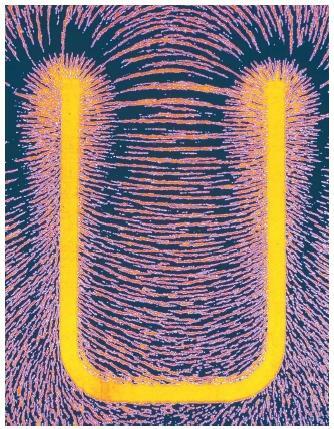 When the material is stroked with a magnet, however, the domains all line themselves up according to the magnetic field of the magnet. All the north poles of the tiny domain magnets are pulled in one direction, and the south poles of those tiny magnets are pulled in the other direction. The material itself has now become magnetic. Electromagnets are important components of many appliances, ranging from machines as large as particle accelerators (atom-smashers) to devices as small as pocket radios. They are used in household appliances that include dishwashers and washing machines; in electric meters; in loudspeakers, telephones, and earphones; in magnetic recording and storing devices; and in MRI (magnetic resonance imaging) devices (a diagnostic tool now found in most hospitals). when a magnet is turn in to pieces. the magnet is consider to be another magnet but it has a lesser force of magnetic field. The magnets can have different kind of forms. but they always have two poles.If you break a magnet it's charge will never disappear it just will be in pieces.